All parents have different perceptions of risk, which affect our choices about safety precautions for our children, regardless of whether we are strongly safety-conscious or only want to focus on the basics and prioritize how best to protect the young ones in our households. The good news is that accidental injury among children ages 1 to 14 has declined by approximately 40 percent over the past 30 - 40 years. While motor vehicle accidents represent the greatest overall risk for children -- making it essential to have our children properly secured in a child restraint appropriate for age, size and weight -- home-related injuries account for the majority of childhood injuries. Home-related risks evolve as children grow from being preciously immobile to rolling, crawling, standing, running, climbing and jumping. Parents need to review safety precautions periodically to consider new phases of physical growth, mental development and access to areas around the house. Many families tackle this in a reactive manner, but far greater safety and peace of mind will result from scheduling a quarterly family safety review. 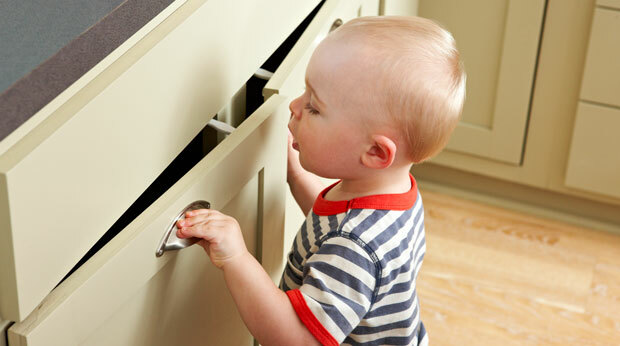 The first phase of baby-proofing should begin prior to a child being able to move more freely around inside the crib. Young children spend a lot of time in their cribs, and parents often overlook a myriad of safety hazards in and around the crib. Common hazards include: bumpers, blankets (a suffocation risk), electrical cords, wall hangings, mobiles and window treatments/cords. Taking proactive measures with children's safety at home truly makes a difference. Remember, as your child grows, the safety measures should progress, too. * What hazards are applicable at the current state of development? * What are the potential sources of serious injury vs. minor "boo-boos"? * Where are you really spending time vs. areas you can ignore or block off? * What hazardous items can be addressed by simply relocating/removing them? * Can you reasonably watch and steer your children away from certain hazards and still have the ability to relax? Store all household products out of reach; read labels; in the event of poisoning, call Poison Control Center at 1-800-222-1222 (keep number handy). Anchor all dressers, bookcases, TVs to the wall; secure appliances with cords hanging down (don't have cords hanging down). Keep children strapped in to highchairs and swings; pad corners of tables and window sills; ensure stairs are properly blocked. Establish "no" zones around fireplaces and overs; cover all electrical outlets. Keep food pieces small or mashed; sit while eating; keep all small objects out of reach; avoid keeping loose covers and plush toys in the crib. Never leave children unsupervised in bathtubs, pools or bodies of water; secure all toilet seats in the home. This is an article written by Robert Carter, President of PrepareFirst, Inc. entitled "Home Safety For Baby." I hope you found this article on home safety for baby to be helpful. I also hope you take this opportunity to visit my website (store). We offer Hotslings Adjustable Pouch, Rockin Baby Pouch, Rockin Baby Ring Sling, Seven Everyday slings, and Lil Cub Hub Convertible Baby Carriers in a wide variety of fabrics and colors. Thank you for visiting my blog and hopefully also my website.